The common Goldfish (Carassius auratus) is a relatively small member of the carp (cyprinid) family that is one of the most commonly kept aquarium species in the world and arguably one of the earliest fish to be domesticated. Goldfish are a domesticated version of the less colorful carp species (Carassius auratus) native to east Asia. They were first domesticated over a thousand years ago by the Chinese where several distinct breeds have since been developed. 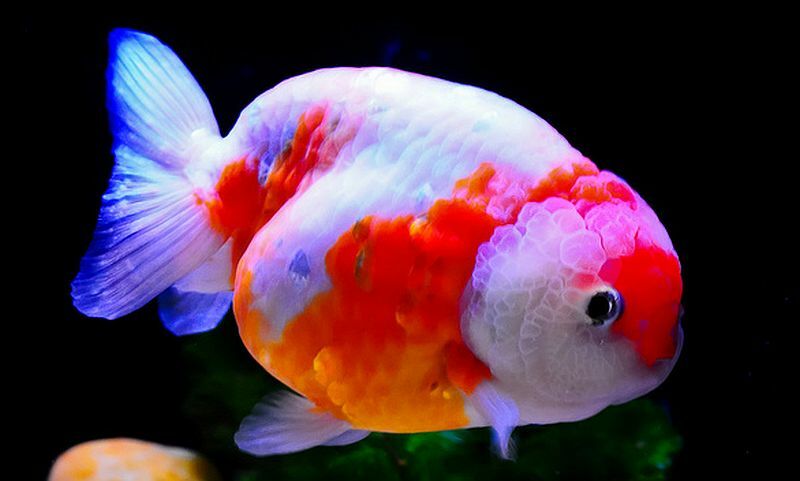 Though they may resemble ornamental carp, Goldfish lack the barbels in the mouth area, the markings at the base of the scales, and do not grow as large as carp and Koi. For thousands of years in ancient China, various species of (Asian) carp were domesticated and reared as food fish. During the Jin dynasty (265–420), breeders observed that some of these normally gray or silver Asian carp produced red, orange, or yellow color mutations. 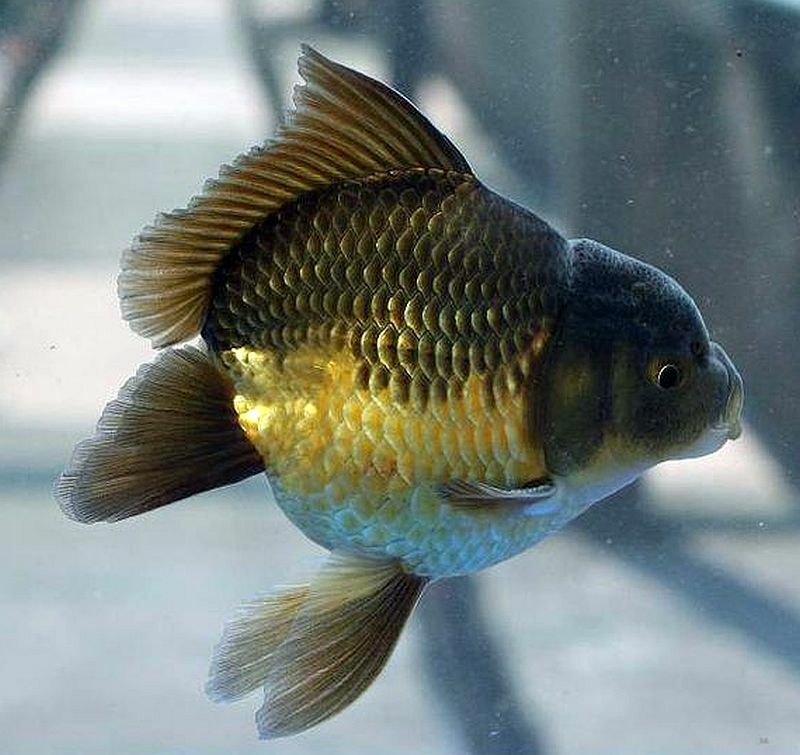 Later, during the Tang dynasty (618–907) when it became popular to raise carp in ornamental ponds and water gardens, a yellowish orange (gold) genetic mutation was produced from the normal silver colored variety and people began to selectively breed them instead of the silver variety. 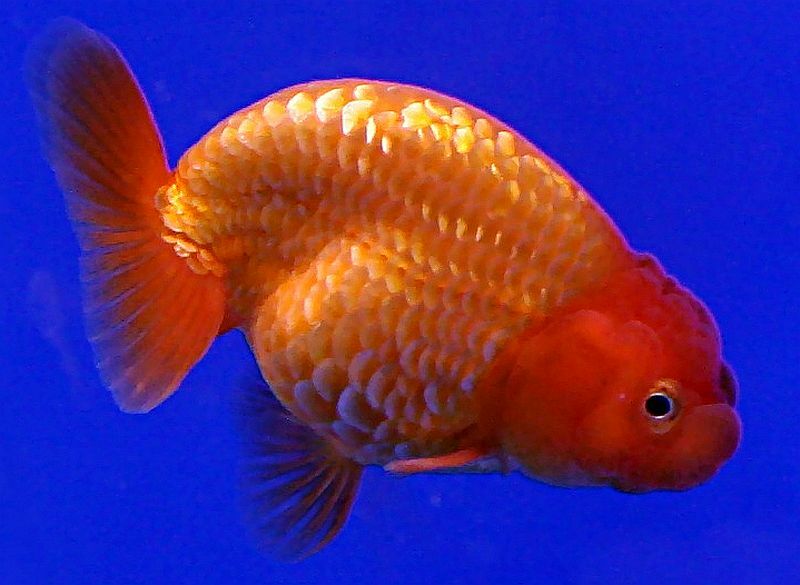 Goldfish domestication was firmly established by the Song dynasty (960–1279) and because yellow (gold) was the imperial color, the empress ordered the collection of all the red and gold varieties of goldfish and made it unlawful for the common people to keep goldfish of the yellow variety. This is no doubt this is why there are more orange than yellow goldfish, even though yellow goldfish are genetically easier to breed. 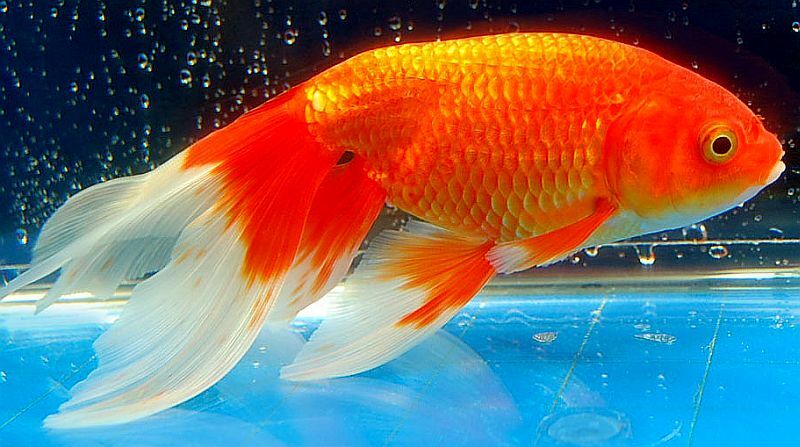 During the Ming dynasty (1368–1644) Goldfish began to be raised indoors. 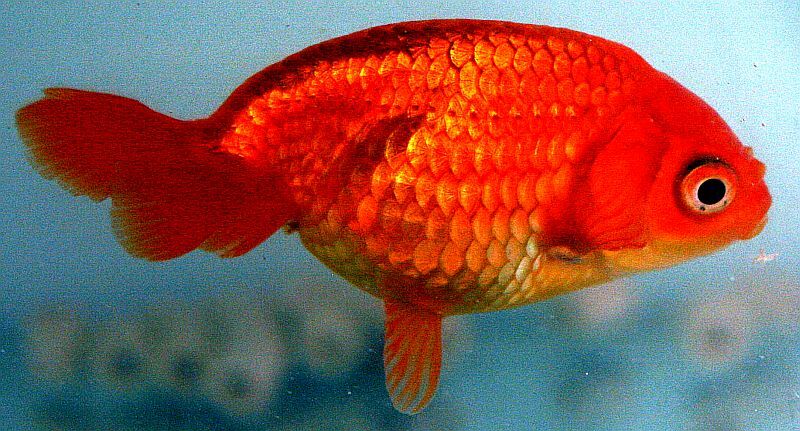 This allowed breeders to selectively breed mutations (such as the fancy tailed goldfish) that would not have been able to survive in outdoor ponds. During the 1600s, Goldfish were introduced into Japan, Portugal, and other parts of Europe where they were highly regarded as a symbol of good luck and fortune. They were not introduced into North America until around 1850 where they quickly became popular with tropical fish keeping enthusiasts. 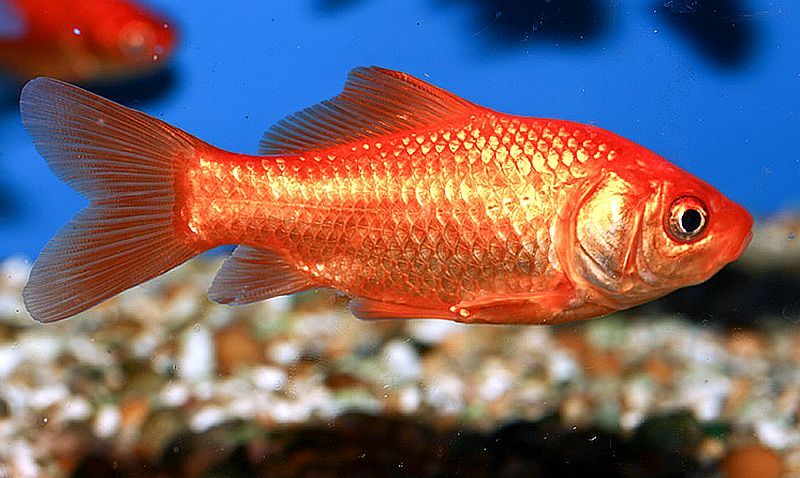 There are currently about 300 recognized breeds of “goldfish” in China. Selective breeding over the centuries has produced many color variations, body shapes, fin types, and eye configurations that may be hardier or less hardy than the “wild” Prussian carp (Carassius auratus gibelio) they were originally bred from. The Common goldfish differ only in color from their closest relative, the Prussian or Gibel carp. They are found in a variety of colors including red, orange, gold, white, black and yellow, and lemon. 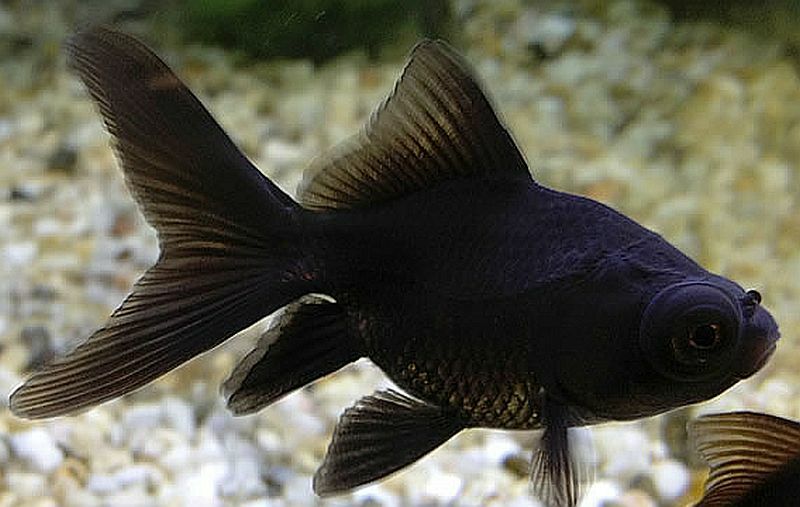 The Black telescope, also referred to as the Black Moor, is a black variant of the telescope goldfish that has a characteristic pair of protruding eyes. 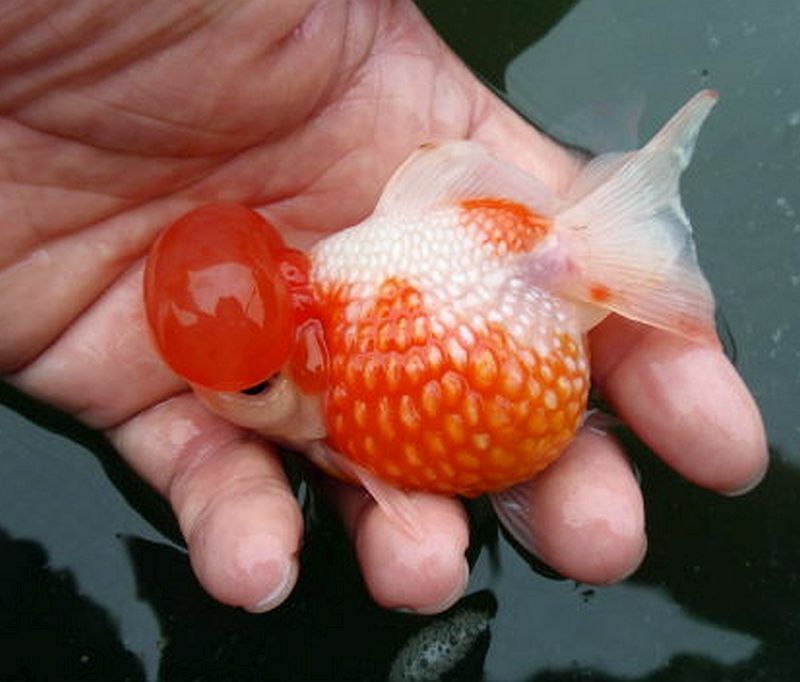 They are also referred to as popeye goldfish, telescope goldfish, kuro Demekin in Japan, and Dragon Eyes in China. 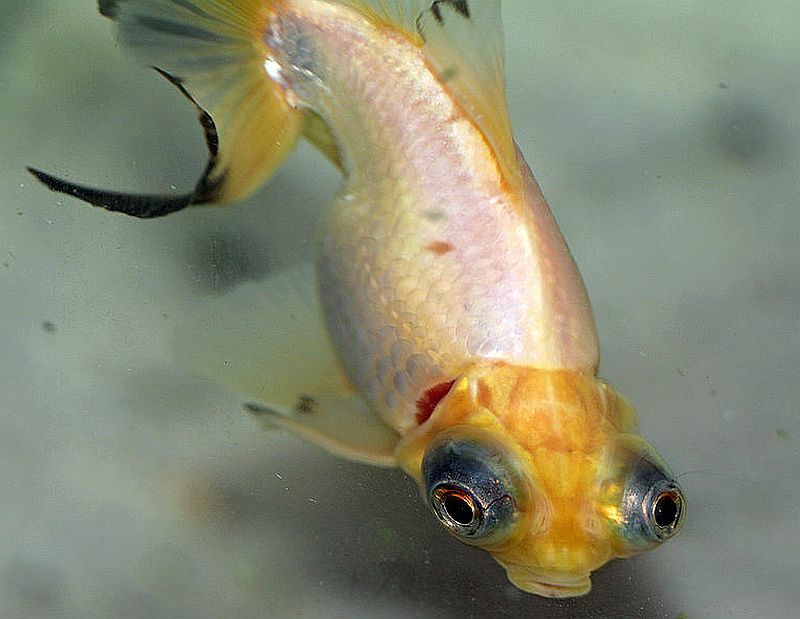 Bubble Eye goldfish are a small dorsal-less fancy variety that have upward pointing eyes accompanied by two large fluid-filled sacs. The Fancy Celestial Eye goldfish or Choten gan has a double tail and a pair of upturned, telescopic eyes with the pupils gazing skyward. The comet small or Comet-tailed goldfish is the most common fancy variety in the United States. It resembles the common goldfish but it is slightly smaller, slimmer, and can be easily distinguished by its long, deeply forked tail. 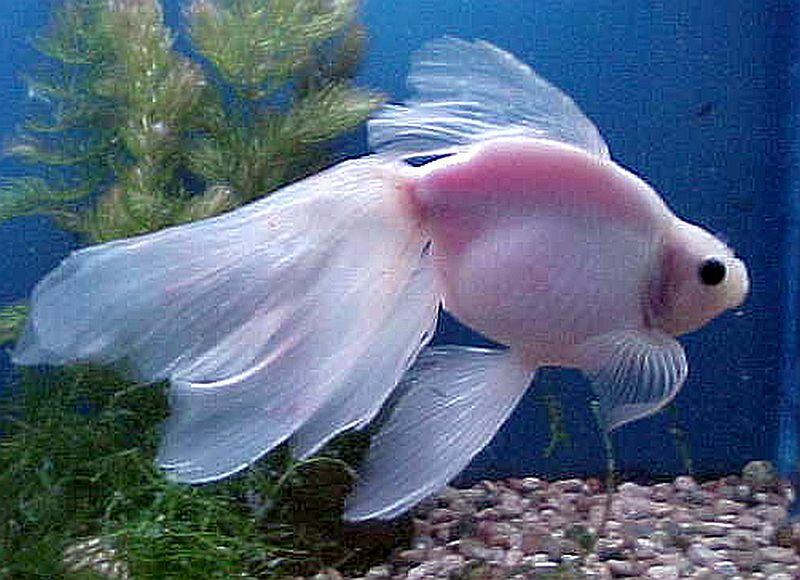 The Fantail goldfish is the western form of the Ryukin and possesses an egg-shaped body, a high dorsal fin, a long quadruple caudal fin, and no shoulder hump. The fancy Lionhead Goldfish has a tremendous hood or head growth with fat cheeks and a turned down tail. This goldfish is the precursor to the Japanese bred ranchu. 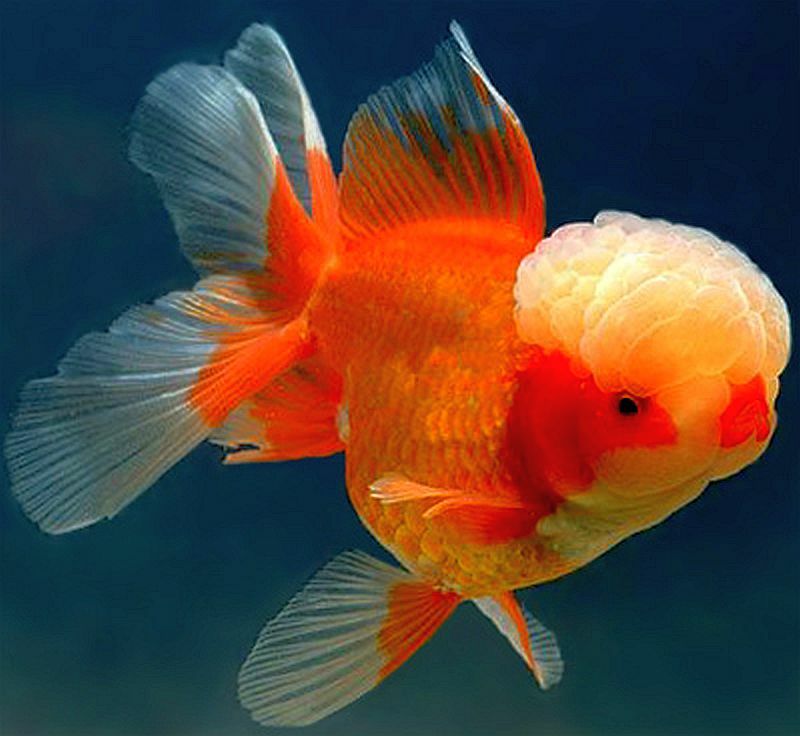 The fancy Oranda is characterized by a prominent bubble like “hood” on the head (also known as wen or head growth) that encases the whole head except for the eyes and mouth. The fancy Pearlscale or (in Japanese) Chinshurin, is a spherical (golf ball) bodied variety with fins similar to the Fantail variety. They can grow to tennis ball size. 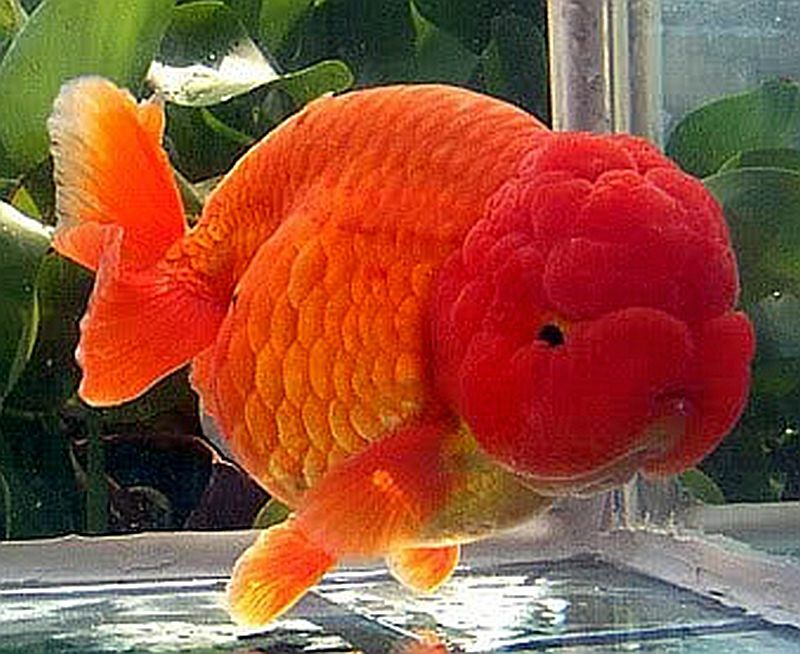 The fancy Pompon or Hana Fusa goldfish have bundles of loose fleshy outgrowths between their nostrils, on each side of the head. 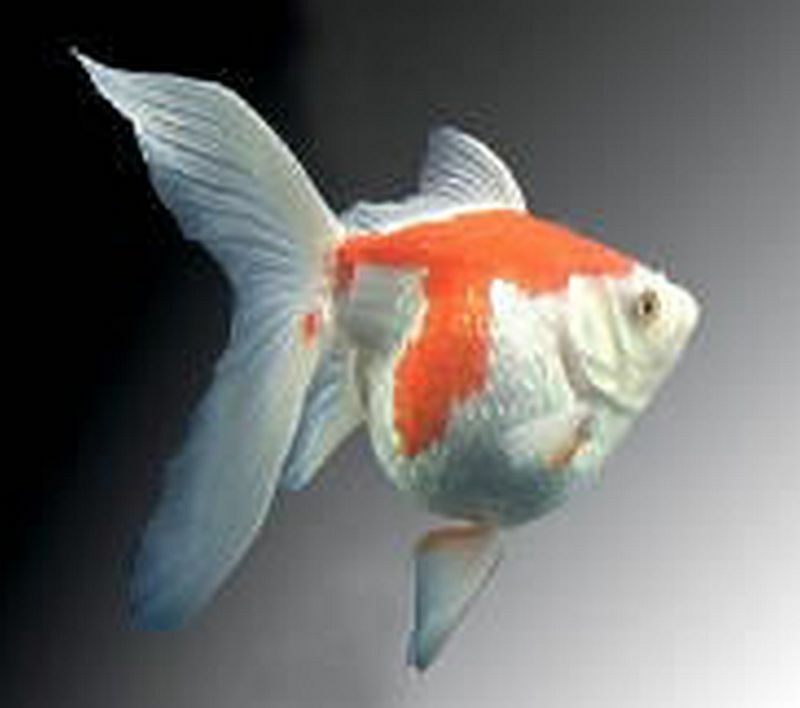 The fancy Ryukin is a short, deep body goldfish with a characteristic shoulder hump. They can be long-finned or short-finned with either a triple or quadruple tail. The dorsal fin is high and the caudal fin is often twice as long as the body. The Japanese Shubunkin goldfish is a hardy, single tail variety with nacreous scales and a pattern known as calico. 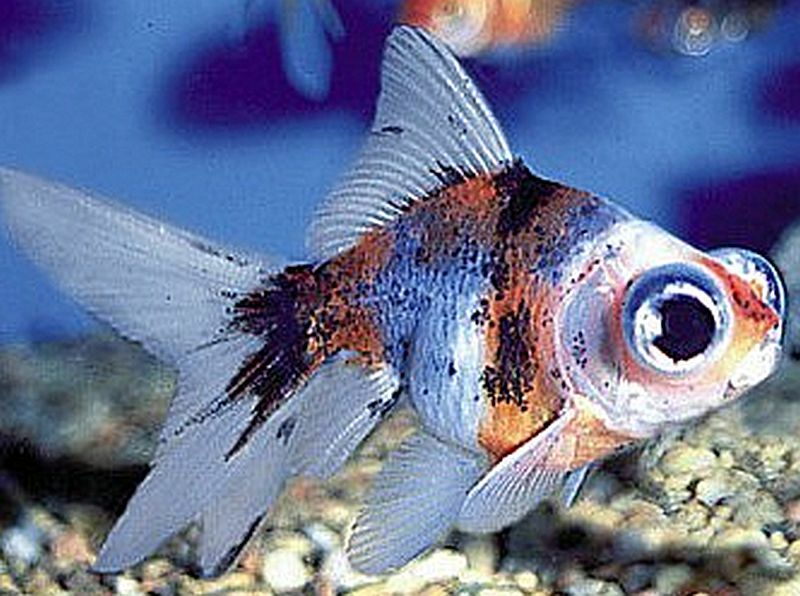 It is a cross between the Calico telescope eye and the Common goldfish. The fancy Telescope goldfish is characterized by its protruding eyes. It is also known as the Globe eye or Dragon eye goldfish. 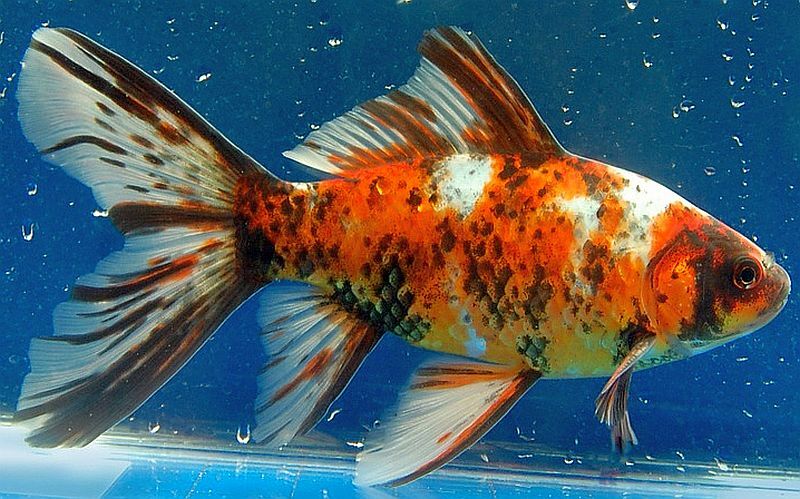 The fancy Ranchu goldfish is a hooded variety that was developed in Japan by crossing different Lionhead goldfish. 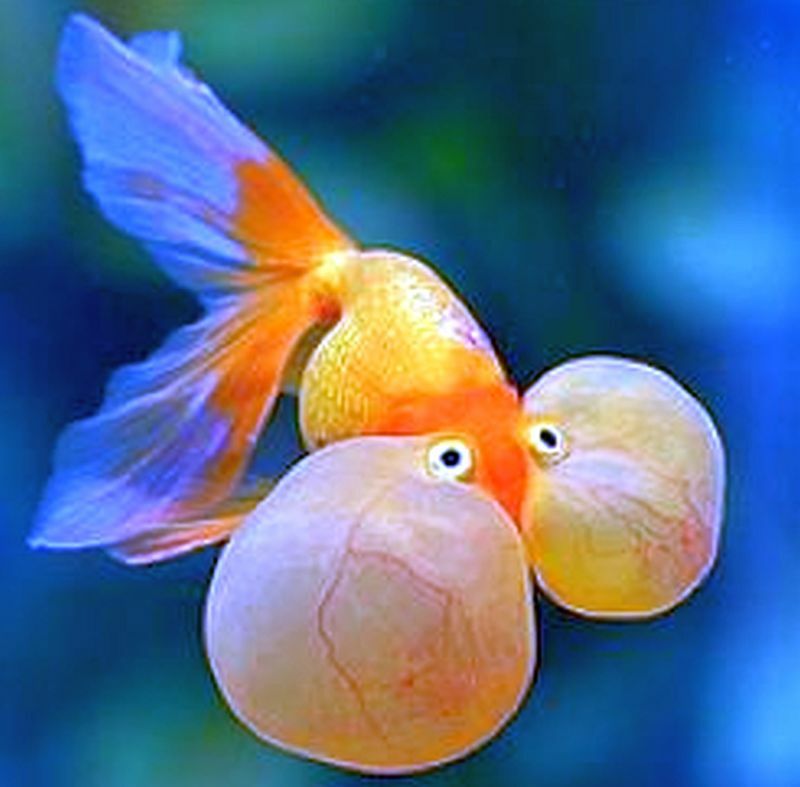 In Japan it is referred to as the “king of goldfish”. The fancy Panda Telescope is a panda variant of telescope goldfish. They have the characteristic (Panda) black and white color pattern with telescopic protruding eyes. 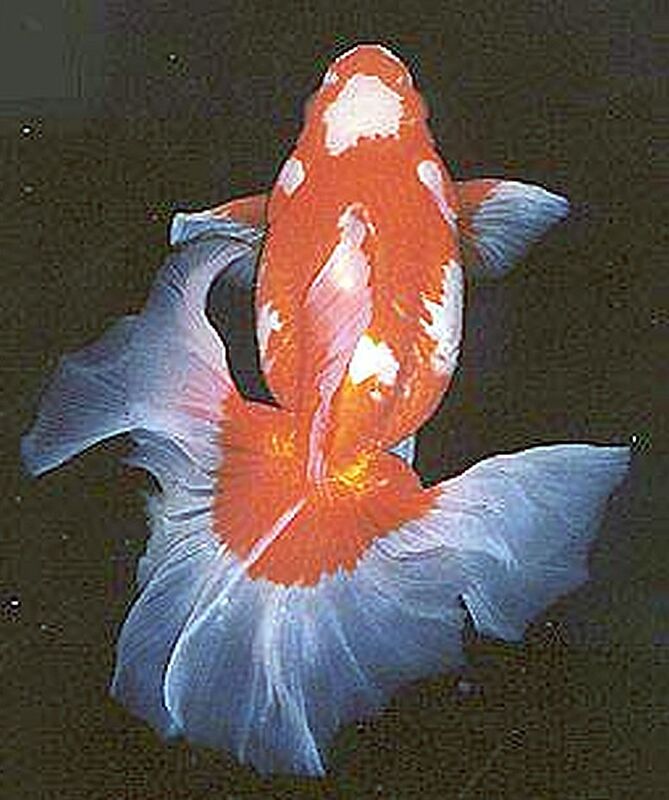 The fancy Veiltail goldfish is knwn for its extra long, flowing double tail and it’s sail type dorsal fin. The hallmark of the breed is it’s long, graceful double tail which is square edged and without any forking or indentation between the lobes. Modern standards require little to no indentation of the trailing edges of the caudal fins, as in a wedding veil for a bride. The Butterfly Tail Moor or Butterfly Telescope is twin tailed variety of goldfish that when viewed from above resembles the spread of a butterfly’s wings. 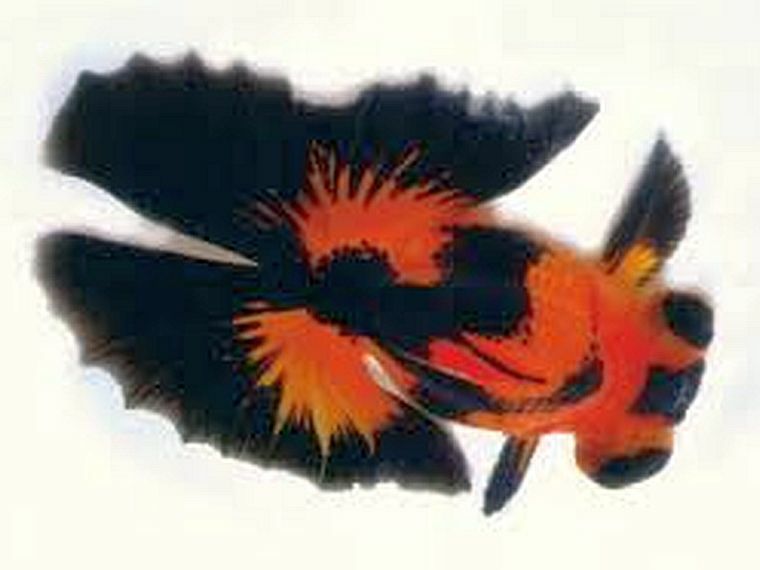 The Meteor goldfish is a strange looking variety that was developed by specialist breeders to have no tail fin, hence its name. Despite the lack of a caudal fin, the other fins are elongated and it is said to swim surprising well. 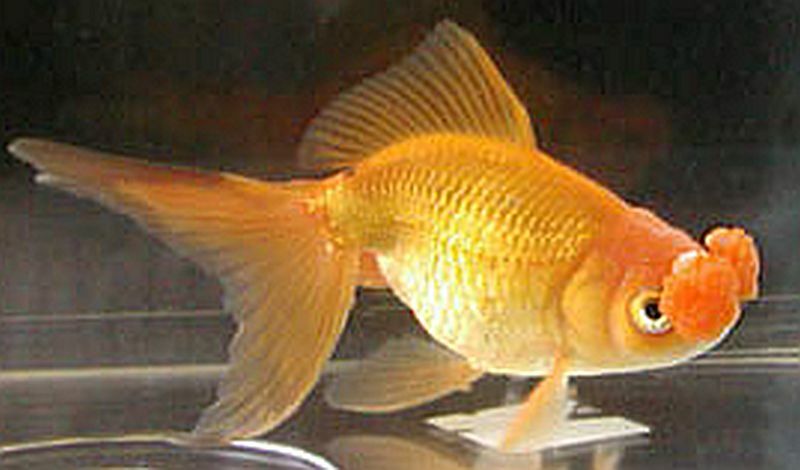 The Lionchu or Lionhead Ranchu goldfish is a result of crossbreeding Lionhead goldfish with Ranchus. The Egg-fish goldfish is a fancy goldfish that lacks a dorsal fin and has a pronounced egg shaped body. The Phoenix is a Chinese variety of the Egg-fish that also has an egg shaped body and a long tail, without a dorsal fin and no head growth. Both varieties are bred in all shades of color and scale types. The Shukin goldfish is Ranchu like variety that was developed in 19th century Japan from the Oranda varieties. 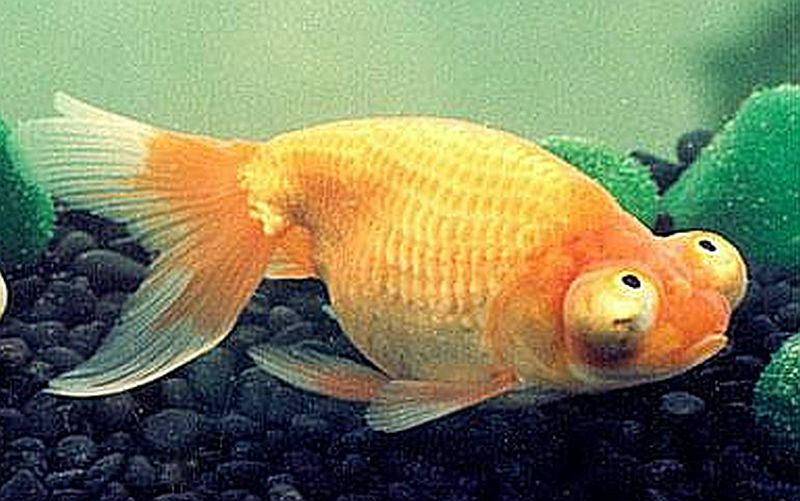 It’s body is shaped like a long Ranchu and it’s tail is long like the Oranda. They come in red, red and white, white, blue, and silver. 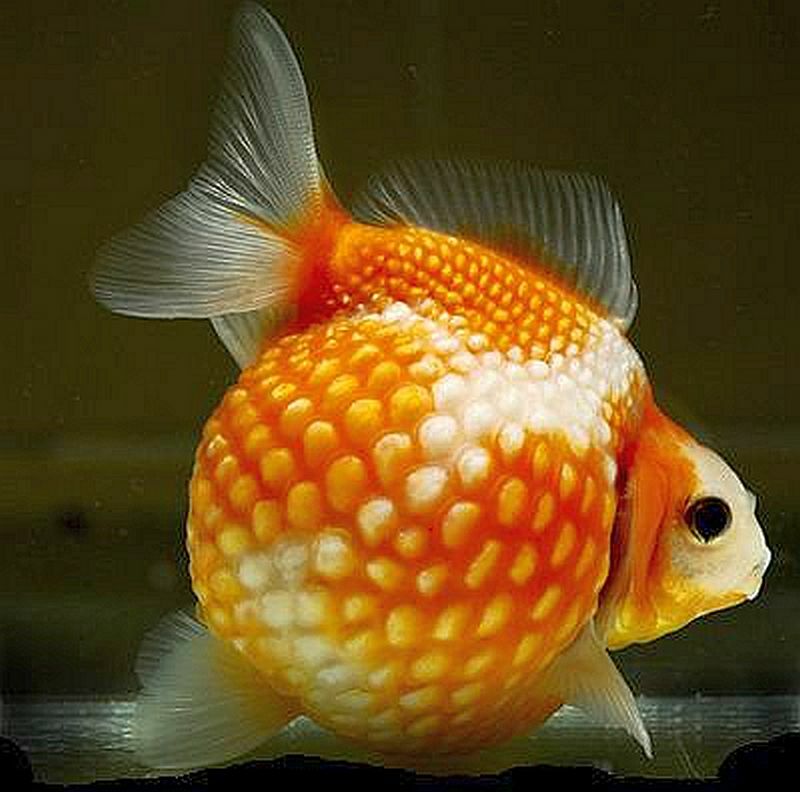 The Curled-gill or Reversed-gill goldfish is an uncommon variety that has was developed by specialist breeders. 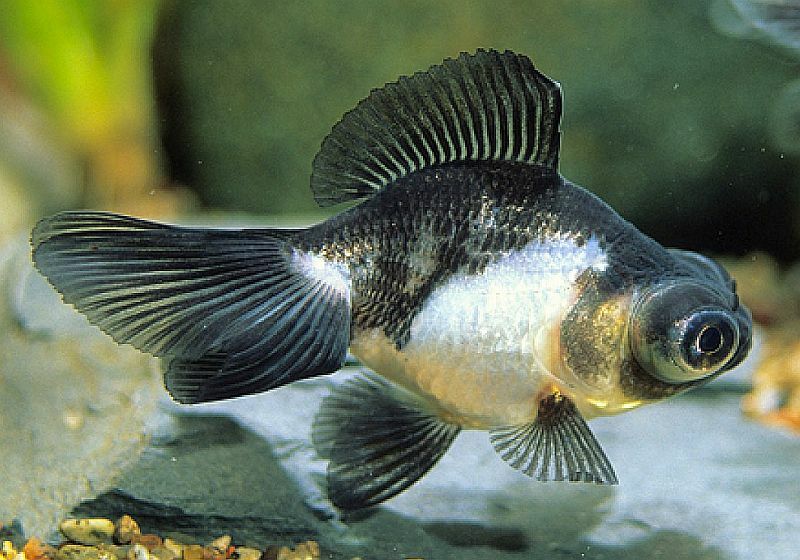 Although it resembles a Ryukin, it’s name is derived by the unusual out turned appearance of its gill covers. The Tamasaba or Sabao goldfish is a rarer Japanesevariety that has a body shaped similar to the Ryukin with a very long, flowing, single tail that resembles a mackerel’s tail, hence its other common name, Mackerel Tail. 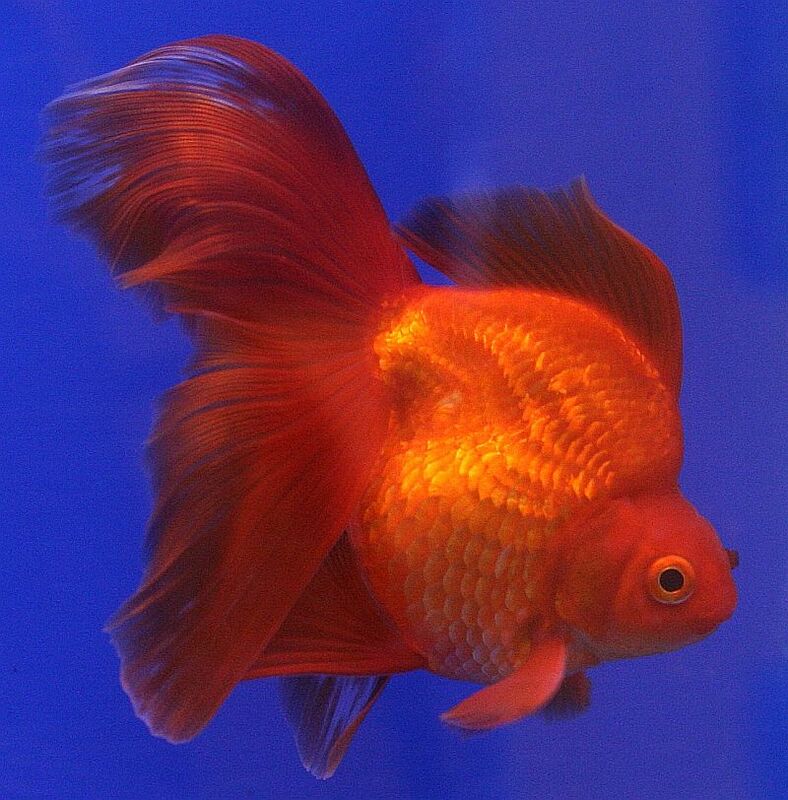 The Tosakin or Curly fantail goldfish is a very distinctive breed with a large tail fin that spreads out (like a fan) horizontally behind the fish. Although it technically has a divided tail, the two halves are attached at the center, in the middle to form a single fin. Goldfish are a peaceful, gregarious species that often display schooling behavior and are able to thrive in a wide variety of environmental conditions. They are suitable for cooler water community aquariums, small water gardens, and outdoor ponds. The only time they ever display any type of combative behavior towards each other is when they are competing for food. For this reason, it is recommended that only breeds with similar body types and swimming characteristics be kept together. Mixing faster swimming breeds like Comets, with slower swimming variants like Pearlscales, can lead to stunted growth or starvation, especially in ponds and water gardens. The faster fish will quickly eat all the food before the slower swimming species can get to it. 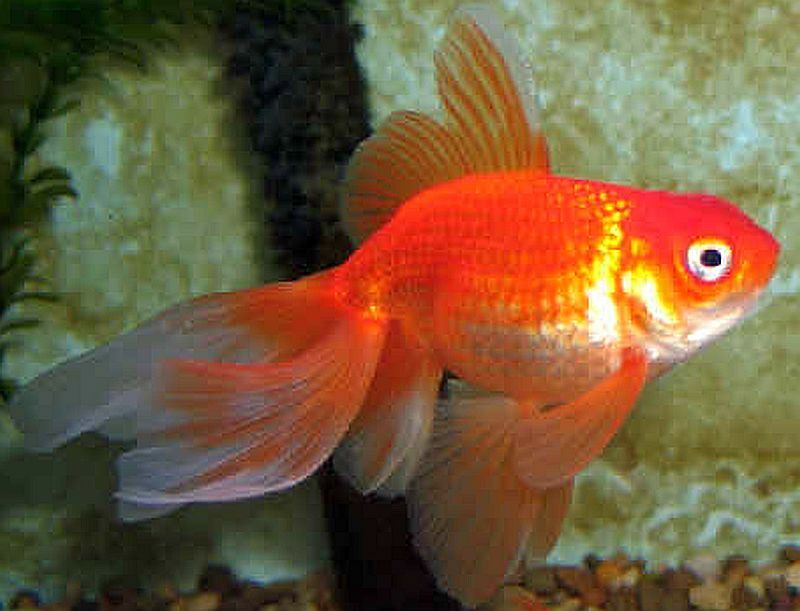 Goldfish are best kept in large aquariums, water gardens, and ponds of at least 180 gallons or larger. They do best with a gravel substrate, river rocks, and cold hardy plants. When using a fine gravel or sandy substrate, place some large rocks around the base of the plants to protect their roots from being dug up by the fish. Goldfish will eat the roots of plants and love to dig around in the substrate. All goldfish are messy and expel copious amounts of waste, so adequate filtration is necessary to maintain proper water quality. 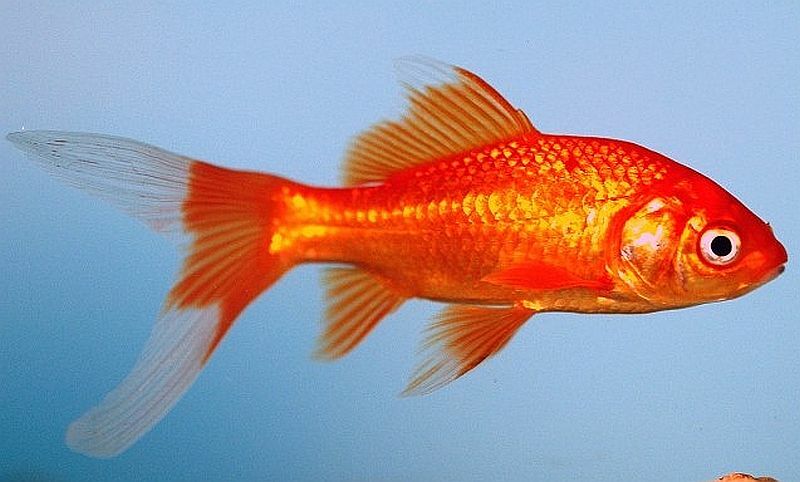 Goldfish are relatively easy to breed. Generally before goldfish will begin to spawn, the water temperature needs to drop down to 64*F for up to a 4 month period. After 4 months at 64 degrees F, a slow warming of the water to 70-74 degrees F will trigger the spawning process. The Male goldfish will endlessly chase the female around the tank until she tires out and releases her eggs (up to hundreds of thousands) all over the tank. Most of the eggs will adhere to the plants in the breeding tank or pond and the male will spray his milt over the eggs. The tank or pond water will turn milky from the milt and in about 3 to 4 hours the spawning should stop. Remove the fertilized eggs from the tank or pond, and place them into a separate 3 to 5 gallon rearing tank with heater, an air powered sponge filter, and not more than 6 inches of water. Too much water makes it difficult for the fry to swim to the surface. At 70 degrees F. the eggs will hatch in about 5 days. At 65 degrees F. it will take 7 days for the eggs to hatch. Remove all the white and fungus covered eggs from the tank. Healthy eggs will be transparent in color. After four days you should be able to see a small black dot inside the goldfish eggs and around the 7th day, the fry will emerge from the eggs and stick to the plants in the tank. After 3 more days the fry will be free swimming. The fry can be fed micro worms, crushed hard boiled egg yolk, finely crushed omnivore flakes, liquid fry food, or frozen baby brine shrimp. Feed the fry three times a day, with as much as they can consume without fouling the water. The fry grow quickly and should be transferred to “growing” tanks as they outgrow their surroundings. In the wild Goldfish are opportunistic feeders and will forage on insects, crustaceans, and a variety of plant matter. They do not stop eating on their own accord and domestically bred goldfish can actually gorge themselves to death. When you spot a fish with feces trailing from the fish’s cloaca, it is being overfed and they are producing more waste than their intestinal tract can digest. Goldfish flakes have less protein and more carbohydrates than conventional fish foods and should be provided as a staple with occasional supplements of bloodworms, blanched leafy vegetables and peas with the shells removed. Young goldfish will also benefit from fresh live or frozen brine shrimp.